The department of Human Anatomy trains nurses under the AMREF/UON program. This students get practical lessons at the department before they proceed for didactic lectures and practicals at KNH and AMREF. This collaboration has been on going for the last 3 years. 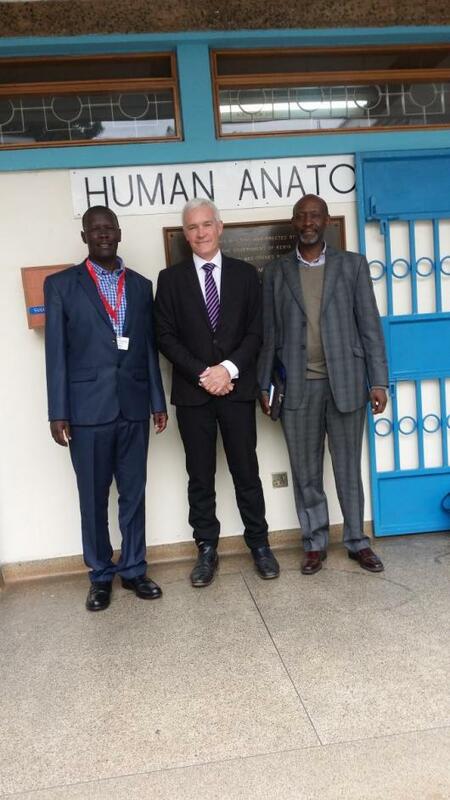 The deparment of Human Anatomy and the Fan lab university of Nairobi are working on delveloping several teaching and clinical models. These include bones, joints and other human part models. The department through Prof. Hassan Saidi collaborates with Sanofi Aventis on research on prevention of deep venous thrombosis. The department of Human Anatomy seeks to collaborate with Baird Institute of Applied Heart and Lung Research in basic research and surgical skills training. Prof. Paul Bannon, the Chair Board of Directors of Baird Institute visited the department on 20th August 2015. He was accompained by Prof. Mwaniki. In the maiden meeting, Prof. Hassan Saidi highlited the interest areas of collaboration in basic research and basic surgical skill training at the NSSC. There will be subsequent meeting to concretise the details of the collaboration. Dr. Kevin Ongeti was also in attendance.